ROW80 check-ins back on the website! Hi folks. I haven’t been writing progress reports because I’d fallen off the blogging wagon since ROW80 moved primarily to Facebook. FB is a useful place but I honestly don’t hang out there much so I’ve been out of touch. But my work has continued in its own halting way. I’m in the beginning of a new batch of artwork for a gardening game I want to create. In anticipation I’ve been running through tutorials on the Unity game engine and studying pixel art lessons, too. Now that I have the encouragement of the web site back I’ll post my progress on the usual ROW80 schedule. In the meantime, here’s today’s list of other ROW80 check-ins. Well, here I am checking in for the last time as this Round of Words in 80 Days is ending. I had some progress and then at the end quit doing ROW80 work entirely and instead worked on my summer garden. So it was a mixed bag in terms of meeting my goals. 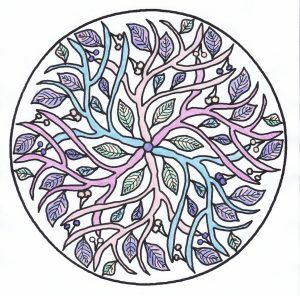 I did finish one very intricate picture (see image below) and I’m happy with that. I started another, simpler illustration for the book’s interior. And I did a little work on the manuscript itself. So there is work that got done but I’d say only 50% of what I set out to do. It’s entirely common for my writing work to slow down once I start gardening in the summer. Once everything’s planted and the heat sets in, I’ll have more brain space for work again. The heat has definitely started, but I have a bit more planting to do. Should be finished by the next round. 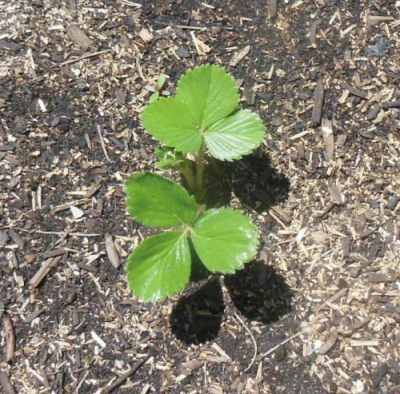 Baby strawberry plant! There are 20 of them. I had an itch to pick up some of my fiction again, so I’m thinking about how to design my goals for next round. Thank you all for the regular support you’ve shown me. I wish you all the best. Here is the blog hop link for this final ROW80 Check-in. See you all next round! Last week I once again hit about 60% of my goal time. Partly that was my own tendency to hide from the work, but also we had a lot of house things going on what with getting the roof replaced and dealing with chores around that. I’m happy to make progress towards my goals, annoyed that I continue to make less progress than I know I am capable of, and very happy to once again have a whole roof overhead. The picture here is another small art thing I did last week. I am unsure whether to consider coloring in already-drawn pages as an art form, but overall I think it must be art of some kind. It certainly scratches that itch for me a bit, even though it’s not original creative work. But I enjoy it and find it absorbs some of that anxiety I so often feel. Overall, a good thing. Off to attempt another week! Here is the blog hop link for today’s check-in. Yes, it’s true. I am still held back by fear and it has started to bore me. I mean, okay I know this anxiety. I’ve carried it with me, I’ve fought it for many, many years. I’ve made a lot of progress, too, on understanding where the fear lives and how to move past it. And last week I had the fear again and it slowed me down. But in addition to the fear I felt annoyed. I know you, fear, and you bore me. As I’ve discovered with my other projects, the main place fear still arises and causes me to lose ground is when I look at, get near, or even ponder finishing a thing. Anything, not only writing but artwork or any kind of creative work will invoke the fear. And I’ve let it stop me cold far too often. Which is the long way of reporting that I only hit about 30% of my goal time last week, entirely because of anxiety and fear. I am happy that it was at least 30%, and that I’ve continued the work this week as well. I am very close to finishing this picture, and determined to push through this one, and then the next, and the text, and this book. 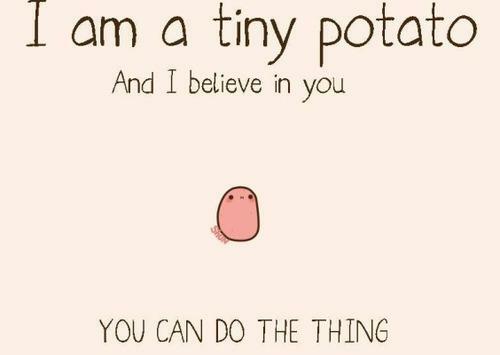 I don’t know who made this silly little picture, but for some reason the tiny potato makes me happy. So I share this with you. I’d love to credit the creator, so please post in comments if you know. Meanwhile, here’s the blog hop link for today’s check-in. May we all have confidence in our ability to create, and to finish. This past week went better, as I managed to put in about 90% of my goal time. I’m still struggling with the final bits of this artwork, because of course as usual I’ve left the messiest bits for last. But I’m slowly getting through them, bit by bit by bit. And this morning there is sunshine again, which makes me really happy. Colorado is supposed to be sunny, dammit, and day after day of gray gloom is not normal here. But that’s what we had for the past week, and it didn’t help my mood at all let me tell you. If only it stays sunny, perhaps we can finally get the new roof put on, and maybe I can get out to work in my garden beds some more. Planting time will be here soon, so digging time is now. Or will be if it doesn’t start snowing again. Meanwhile, here is today’s blog hop link. I hope there’s sunshine for everyone! Hello, everyone. Last week I only worked for 60% of my goal time. Once again I face my own doubts about my ability to finish a project, or finish it up to my standards. And once again, when faced with that doubt I struggle to keep plugging away at the work, as I want so much to do. My response when faced with these internal struggles, what works for me, is to try to view myself with kindness. To give myself credit for every small step I take, even if they are smaller than I would wish. One foot in front of the other, one word or sentence on a book, one line or node on a drawing. It all has to count, because this is the task in front of me: to learn how to cope with my anxieties and how to continue to work in spite of them. So that’s what I’m doing. I even posted my check-in late this week! But here is the blog hop link for the Wednesday ROW80 checkin. I hope the work is going well for everyone. I came up short in meeting my goal time this week. We are in the middle of getting a new roof for our house (the old one was damaged in a wind storm), and also got involved in our neighbor’s landscaping project which included replacing our mutual fence. I’m very happy with how things are going so far (the fence is awesome; the roof is not replaced yet but we’ve dealt with the insurance part), but it took up a couple days of my week. So my spreadsheet shows that I only hit 60% of goal this week, which is, well, weak. Must do better this time, and in fact have already done today’s scheduled time. The good news is that this incredibly intricate drawing is close to finished. I may even finish it this week if I push a little, and that’s my hope. This is only one portion of the entire project of course. Not only writing and editing still to finish but several more pictures as well (though much simpler and therefore quicker ones). But at this point I’m very happy with the look of this illustration. And finishing any sub-project is always positive for me, and helps me continue working. 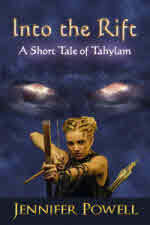 Here is the blog hop link for today’s check-in. May everyone finish their goals in satisfying ways! I love spreadsheets. I know this is an unusual thing, but it’s true. Maybe it’s because in the distant past I spent some years doing accounting of one type or another for various cooperative businesses I was involved with. Back then, accounting of all sorts was done by hand on wide pages of carefully lined accounting paper. Everything was added by hand, and double-posted so that you had a check on your original tallies. Hand-written ledgers could give you the information you needed to run the business (How much of widget X did we sell this week? How much cash do we need to cover next week’s bills? ), but they were labor intensive and, in the end, still limited in what they could do for you. On the computer, spreadsheets do all the math for you! I love this about computers generally, you know, that they do all the math. So I keep spreadsheets for our household bills, and for my garden, and for my small personal businesses, and of course to track my writing. For a while I tracked my writing by word count. That came pretty naturally when I was doing NaNoWriMo back in 2012. But tracking my work by word count quickly faltered. My own way of writing is not a sprint but instead is more of a two steps forward, one step back process where I edit and cut as well as write new words. When I was using the steadily-advancing word count as a motivational tool, any day when my word count went backwards was hard on me. Even though it was necessary for my work, it felt like a failure. So I’ve switched to counting hours spent on projects, and that’s what I track in my spreadsheets now. I still have a list of current word counts on my various projects, but using hours for my daily tracking gives me a sense of progress even if I’ve spent the hour deleting words instead of adding them. Here’s today’s blog hop link for this Round of Words check-in. I hope everyone else is progressing towards their goals, whatever form those goals may take. 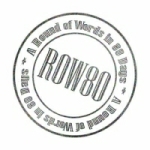 The second Round of Words in 80 Days starts today. My goal, once again, will be to spend one hour each weekday on writing or artwork. I’ve continued this during the brief break and overall I find slow and steady works. So I’m sticking with that. Last week I only met about 85% of goal, as by Friday I felt a bit worn out and didn’t work. But I’d done extra drawing earlier in the week, so overall I wasn’t too short of goal. I’ve already done my stint for today, so this week should be better. I found a new game that I love a lot. It was recommended by some friends online, and it’s called Stardew Valley. 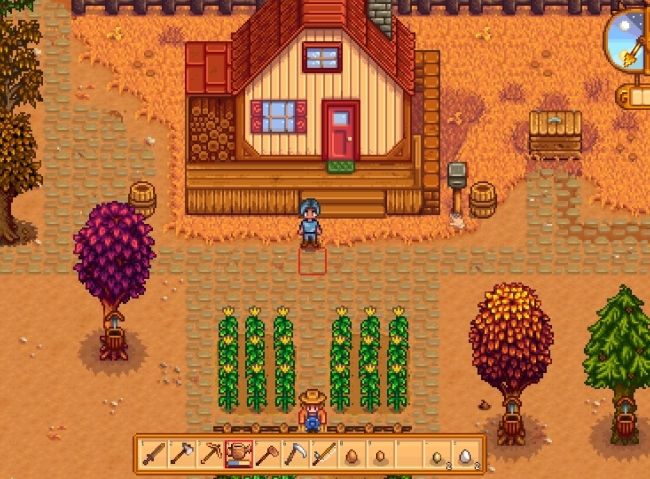 It’s a lovely farming simulator that is based on the old Gamecube game, Harvest Moon. I was a huge fan of Harvest Moon but I think this updated version is even better. It’s still a bit cold and snowy here in Colorado for me to be out in the real garden very often. So if you can’t find me on Twitter, I’m probably down on the farm. And here is the first blog hop link for this Round. Best wishes to everyone! The final week of A Round of Words went well, as I once again reached my goal time for the week. I’m very happy with how I hit my goals this entire Round, in fact. 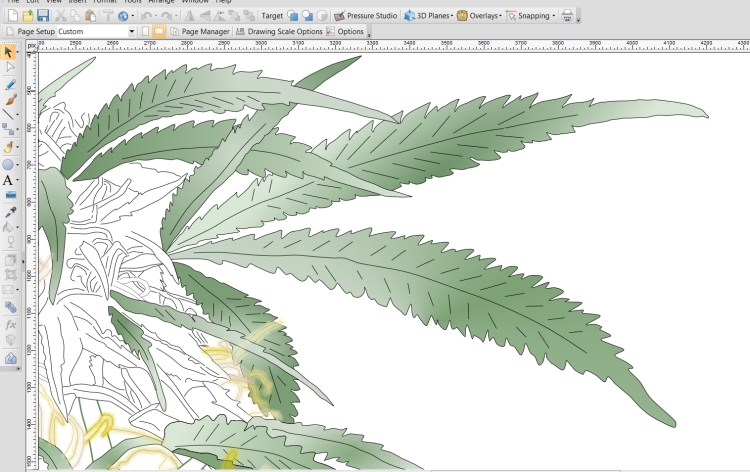 I also feel okay about how this illustration is turning out. I almost believe it will be finished someday! That would be nice. Here is a sample of one portion of the picture I’m currently working on. This shows just a few leaves. There are many dozens of these gradient-filled leaves. In fact the layer where I’m drawing them tells me it contains 822 objects as of this moment. 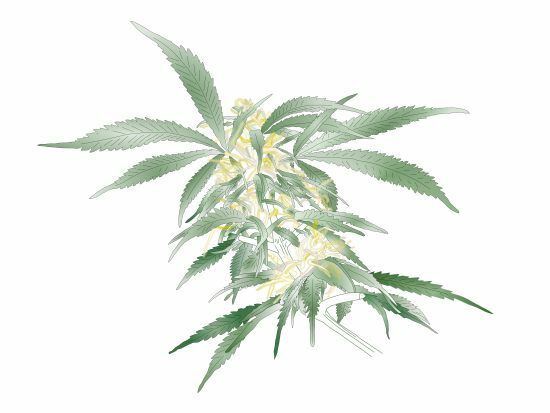 The layer with the brush strokes for the pistils tells me it has 114 objects. There are many more to go. The photo I’m working from isn’t visible here but much of my sketching has been done using a Turcom drawing tablet over a visible photo behind the working layer. (I lower the opacity of the photo so that I can see the lines as I draw them.) One thing I’ve learned is that when I’m sketching with the tablet I rarely get a smooth single line. My hands are not that steady and so the line will instead have several segments. And in places where the photo is dense, I often end up with a jumble of line segments (as you can see in this example, in the parts not yet finished and colored). Much of my time is spent teasing out which segments belong together to form a full object (stem, leaf, or pistil), and which need to be culled or combined. It’s fiddly work, and slow, but I think the outcome is worth it. Okay, there is no blog hop this week, but I am back to work. I’ll check in again next Monday.